Download any of these projects for free* and explore Pix4D’s desktop functionalities with a real dataset. Important: *These datasets may only be used for personal or professional training. For commercial or promotional use, “Courtesy of Pix4D / pix4d.com” must be displayed and all the text linked to pix4d.com. For more information on usage, contact our marketing team. Using real data demonstrates what Pix4D software can do and will help you understand what’s needed when collecting your own data. Not sure where to begin? Follow the instructions below each data set to create your first project. For more inspiration, check out our Community Hall of Fame. The goal of this project is to generate a DSM and an Orthomosaic of a quarry using an eBee drone with a SenseFly S.O.D.A. 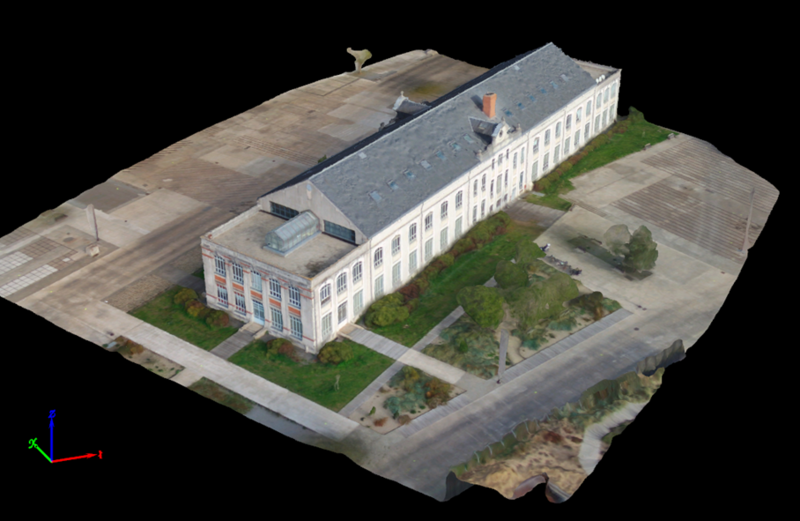 The dataset can be downloaded here and can be found processed on Pix4D Cloud here. inputs/gcpPositionsLatLongAlt.csv: GCP input geolocation file. example_quarry_2.p4d: project file that can be opened in Pix4Dmapper. This section describes how to process the dataset in order to generate the DSM and the Orthomosaic of a quarry. 1. Open the project example_quarry_2.p4d. 2. On the menu bar, click View > Processing. The Processing bar opens at the bottom of the main window. 3. On the Processing bar, click Start to start the processing. This section describes how to create and process a project in order to generate the DSM and the Orthomosaic of a quarry. 3. The New Project wizard opens. 4. In Name: Type a name for the project. In this example type example_quarry_2. 5. (optional) In Create In: click Browse..., and in the Select Project Location pop-up, navigate to select the folder where the project and results will be stored and click Select Folder. Note: When the project is created, a folder named after the project name typed in the Name field will be created in the selected folder and will store all the results. The .p4d project file will also be stored in this folder. 6. (optional) Select the check box Use As Default Project Location to save all new projects in the selected folder. 7. In the section Project Type, keep selected the default option New Project. The New Project wizard displays the Select Images window. 9. Click Add Directories... and select the images folder to add the images to the project. The New Project wizard displays the Image Properties window. The image geolocation is automatically loaded from the image EXIF data and is given in WGS84 (latitude, longitude, altitude) coordinates with vertical coordinate system given by a Geoid Height Above WGS 84 Ellipsoid of 0 meters. The camera model is loaded from the camera model database (S.O.D.A._10.6_5472x3648 (SI002001AA7C00213) (RGB).). The New Project wizard displays the Select Output Coordinate System window. By default the last output coordinate system selected in the software is selected. 13. Select Advanced Coordinate Options and under Vertical Coordinate System select Geoid Height Above WGS 84 Ellipsoid. Set the value to 0. The New Project wizard displays the Processing Options Template window. 15. Click 3D Maps to select the template. Note: As the goal of this project is to generate the DSM and the Orthomosaic, and as it has been taken using aerial nadir images, the template to be selected is the 3D Maps. 16. Click Finish to finish the wizard and create the project. The Processing bar opens at the bottom of the main window. The GCP/MTP Manager window opens. Change the GCP Coordinate System to WGS 84 with a vertical coordinate system given by a Geoid Height Above WGS 84 Ellipsoid of 0 meters. 3. On the Select GCP Coordinate System window, set the Unit to m.
4. On the Select GCP Coordinate System window, select Known Coordinate System [m], type WGS 84 and select it in the drop-down list. 5. On the Select GCP Coordinate System window, select Advanced Coordinate Options and under Vertical Coordinate System select MSL egm96. 6. On the Select GCP Coordinate System window, click OK.
8. On the Import Ground Control Points window, under Coordinates Order, select Latitude, Longitude, Altitude option. 9. On the Import Ground Control Points windows, click Browse, select the GCP file gcpPositionsLatLongAlt.csv from the inputs folder and click OK.
10. On the Import Ground Control Points windows, click OK. The GCPs and their coordinates are imported and can be visualized in the GCP/MTP Manager window. 11. On the GCP/MTP Manager window click OK.
12. On the Processing bar select 1. Initial Processing, deselect 2. Point Cloud and Mesh and 3. DSM, Orthomosaic and Index. 13. On the Processing bar, click Start to start the processing. When step 1. Initial Processing is finished the rayCloud opens. 14. Mark the GCPs using the rayCloud following instructions 2. to 11. as described here How to import and mark ground control points (GCPs). The images in the folder inputs/gcp_overview help to identify the GCPs should be marked. When the GCPs are marked and the project is re-optimized. 1. On the Processing bar, deactivate 1. Initial Processing and activate 2. Point Cloud and Mesh and 3. DSM, Orthomosaic and Index. 2. On the Processing bar, click Start to start the processing. The goal of this project is to generate the DSM and the Orthomosaic of a village using a Canon IXUS 120IS. example_cadastre.p4d: project file that can be opened in Pix4Dmapper. This section describes how to process the dataset in order to generate the DSM and the Orthomosaic of a village. 1. Open the project example_cadastre.p4d. This section describes how to create and process a project in order to generate the DSM and the Orthomosaic of a village. 4. In Name: Type a name for the project. In this example type example_cadastre. 5. (optional) In Create In: Click Browse, and in the Select Project Location pop-up, navigate to select the folder where the project and results will be stored and click Select Folder. The New Project wizard displays the Image Properties window. The image geolocation is automatically loaded from the image EXIF data. The coordinate system is automatically set to WGS84 with vertical coordinate system given in MSL egm96. As the image geolocation is given in WGS 84 with vertical coordinates system in Geoid Height Above WGS 84 Ellipsoid = 0, the coordinate system has to be changed. 12. On the Select Image Coordinate System window, select Known Coordinate System with coordinate system WGS 84. 13. On the Select Image Coordinate System window, select Advanced Coordinate Options, and under Vertical Coordinate System select Geoid Height Above WGS 84 Ellipsoid. Set the value to 0. 14. On the Select Image Coordinate System window, click OK. In the Image Properties window, the camera model is loaded from the camera model database (CanonDIGITALIXUS120IS_5.0_4000x3000 (RGB)). 17. Select Advanced Coordinate Options and under Vertical Coordinate System select Geoid Height Above WGS 84 Ellipsoid. Set the value to 0. 19. Click 3D Maps to select the template. Note: As the goal of this project is to generate the DSM and the Orthomosaic, and as it has been taken using aerial nadir images, the template to be selected is the 3D Maps template. 20. Click Finish to finish the wizard and create the project. The Processing window opens at the bottom of the main window. 1. On the Processing bar, click Start to start the processing. 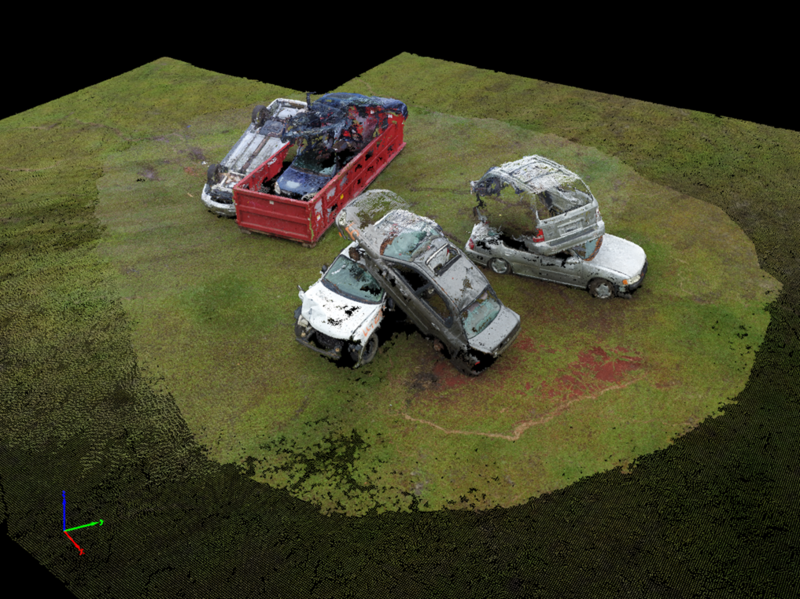 The goal of this project is to generate the Point Cloud and the 3D Textured Mesh of a forensic scene. images: RGB images in JPG format. example_forensic.p4d: project file that can be opened in Pix4Dmapper. This section describes how to process the dataset in order to generate the 3D model of a building. 1. Open the project example_forensic.p4d by double clicking it. 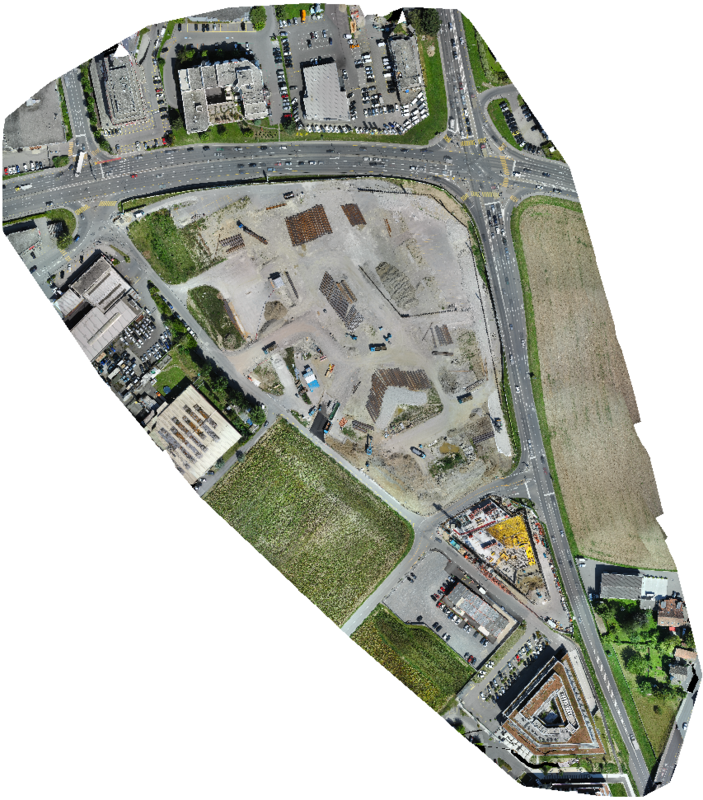 Note: As the goal of this project is to generate the point cloud the 3D model (no DSM and orthomosaic) and as it has been taken using oblique images the template used for the processing has been set to 3D Models. This can be seen in Process > Processing Options... . This section describes how to create and process a project in order to generate a 3D model of a building. 4. In Name: Type a name for the project. In this example type example_building. The New Project wizard displays the Image Properties window. The image geolocation is automatically loaded from the image EXIF data and is given in WGS84 (latitude, longitude, altitude) coordinates with vertical coordinate system given at Geoid Above Ellipsoid=0 m. The camera model is loaded from the camera model database (FC300X_3.6_4000x3000 (RGB)). 12. Under Unit, select m.
14. Select Advanced Coordinate Options and under Vertical Coordinate System select Geoid Above Ellipsoid=0. 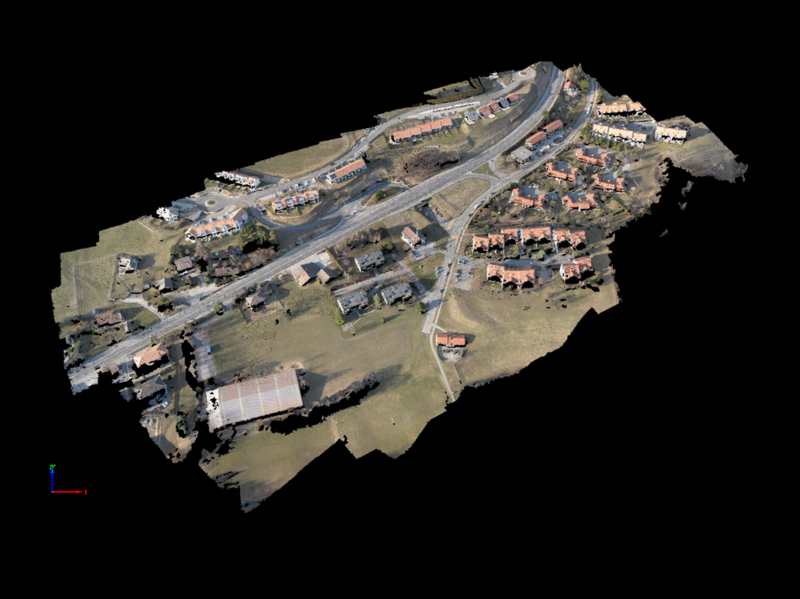 Note: As the goal of this project is to generate the point cloud and the 3D model (no DSM and orthomosaic), and as it has been taken using oblique images, the template to be select is the 3D Models template. 15. Select the 3D Models template. The goal of this project is to generate a thermal map using a FLIR Zenmuse XT thermal camera. thermal.p4d: project file that can be opened in Pix4Dmapper. This section describes how to process the dataset in order to generate the thermal map of the area. This section describes how to create and process a project in order to generate the thermal map. 4. In Name: Type a name for the project. In this example type thermal. As the images are RJPG, the software will automatically convert them to thermal TIFF images and they will be stored in a folder called Converted. Those are the images that the software will use for processing. The New Project wizard displays the Image Properties window. The image geolocation is automatically loaded from the image EXIF data and is given in WGS84 (latitude, longitude, altitude) coordinates with vertical coordinate system given by a Geoid Height Above WGS 84 Ellipsoid of 0 meters. The camera model is loaded from the camera model database (FLIR Zenmuse XT (Thermal)). 15. Click Thermal camera to select the template and check the thermal_ir index to be generated. The goal of this project is to generate the 3D model of a building taken by an AscTec Falcon 8 UAV. example_building.p4d: project file that can be opened in Pix4Dmapper. 1. Open the project example_building.p4d by double clicking it. Note: As the goal of this project is to generate only the 3D model (no DSM and orthomosaic), the template used for the processing has been set to 3D Models. This can be seen in Process > Processing Options... . The New Project wizard displays the Image Properties window. The image geolocation is automatically loaded from the image EXIF data and is given in WGS84 (latitude, longitude, altitude) coordinates with vertical coordinate system given by MSL egm96. The camera model is loaded from the camera model database (NEX-5_E16mmF2.8_16.0_4592x3056 (RGB)). 14. Select Advanced Coordinate Options and under Vertical Coordinate System select MSL > egm96. Note: As the goal of this project is to generate only the 3D model (no DSM and orthomosaic), and as it has been taken using terrestrial images, the template to be select is the 3D Models template. The goal of this project is to generate the 3D model of the statue of an eagle by taking images from the ground using a Canon EOS 7D with perspective lens. example_eagle.p4d: project file that can be opened in Pix4Dmapper. This section describes how to process the dataset in order to generate the 3D model of the statue of an eagle. 1. Open the project example_eagle.p4d by double clicking it. 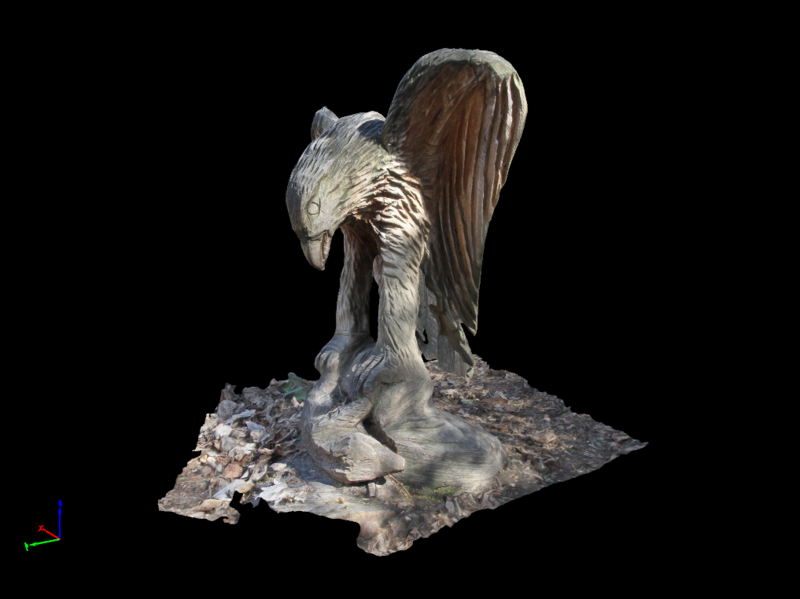 This section describes how to create and process a project in order to generate the 3D model of the statue of an eagle. 4. In Name: Type a name for the project. In this example type example_eagle. 5. (optional) In Create In: Click on Browse, and on the Select Project Location pop-up, navigate to select the folder where the project and results will be stored and click Select Folder. The New Project wizard displays the Image Properties window. No image geolocation is detected. The camera model is loaded from the camera model database (CanonEOS7D_EF-S15-85mmf/3.5-5.6ISUSM_15.0_5184x3456 (RGB)). 12. Select Arbitrary Coordinate System with Unit meters. Note: As the goal of this project is to generate only the 3D model (no DSM and orthomosaic), and as it has been taken using terrestrial images, the template to be selected is the 3D Models. 14. Select the 3D Models template. 15. Click Finish to finish the wizard and create the project. The Processing bar opens at the bottom of the main window. 1. On the Processing bar, select 1. Initial Processing, and deselect 2. Point Cloud and Mesh. When Initial Processing finishes, the rayCloud opens. 3. Use the rayCloud to define a Processing Area to remove noisy points from the background and to keep only points of the statue. For more information about how to draw a Processing Area with the rayCloud: How to select / draw the Processing Area. 4. Edit the Processing Area such that the height adjusts to the height of the statue. For more information about how to edit a Processing Area with the rayCloud: How to edit a Processing Area in the rayCloud. Note: In the above Processing Area, the Maximum and Minimum Altitude are set to 50.00 [m] and -100.00 [m] respectively. 5. On the Processing bar, deselect 1. Initial Processing, and select 2. Point Cloud and Mesh. 6. On the Processing bar, click Start to start processing. The goal of this project is to get a 3D model of buildings using a DJI Phantom 4 and acquiring the images with Pix4Dcapture. Image acquisition plan Circular mission, 4° angle between images, 30m above ground. images: RGB images in JPG format. The image's resolution is half the original image resolution. dji_demo.p4d: project file that can be opened in Pix4Dmapper. This section describes how to process the dataset using the included .p4d project file in order to generate a 3D mesh of buildings. 1. Open the project dji_demo.p4d. 2. On the menu bar, click View > Processing. The Processing window opens at the bottom of the main window. 3. On the Processing window, click Start to start the processing. Note: As the goal of this project is to get a 3D Model, the template used for the processing has been set to 3D Model. This can be seen in Process > Processing Options.... . 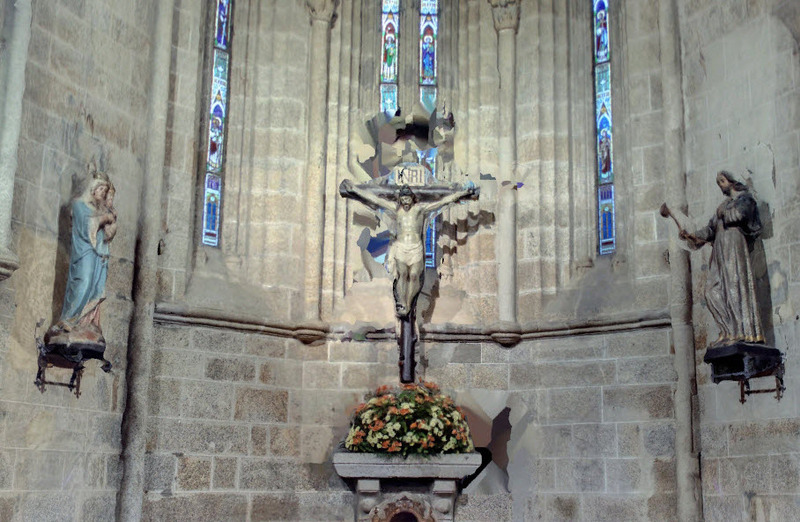 The goal of this project is to generate the 3D model of a church taken by an NCTech iSTAR spherical camera. example_spherical.p4d: project file that can be opened in Pix4Dmapper. 1. Open the project example_spherical.p4d by double clicking it. Note: As the goal of this project is to generate only the 3D model (no DSM or Orthomosaic), the template selected for processing is 3D Models. This can be seen in Process > Processing Options... .
4. In Name: Type a name for the project. In this example, type example_spherical. The New Project wizard displays the Image Properties window. No image geolocation is detected. The camera model is loaded from the camera model database (iSTAR_2.7_10000X5000(RGB)). Note: As the goal of this project is to generate only a 3D model (no DSM or orthomosaic), the template selected for processing is 3D Models. 3. Select the tab General. 4. In the section Keypoints Image Scale, select Custom and from the drop down list select 1 (Original Image size). Note: This selection allows to extract the keypoints using the original image size. 5. In the Processing Options window click 2. Point Cloud and Mesh. 6. Select the tab Point Cloud. 7. In the Point Cloud Densification section click the drop-down list Image scale and select 1 (Original Image size, Slow) and from the drop-down list Point Density select High (Slow). Note: The original image size is used to compute additional 3D points. More points are computed especially in areas where features can be easily matched. By selecting High Point Density, a 3D point will be computed for every Image Scale pixel. For more information about the Processing Options: Menu Process > Processing Options... > 2. Point Cloud and Mesh > Point Cloud. 9. On the Processing bar, click Start to start the processing. The goal of this project is to get a 3D model of industrial building. Images were acquired with Parrot Bebop 2 using Pix4Dcapture. 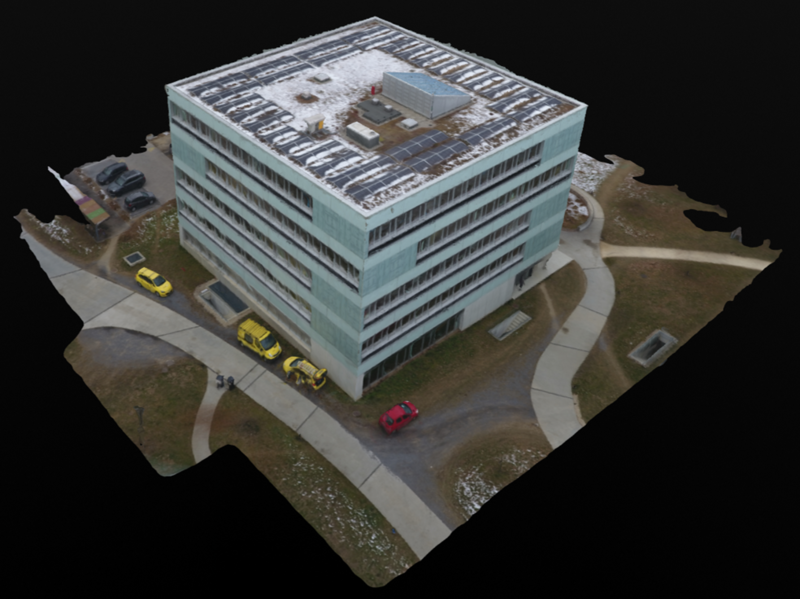 example_bebop2_industrial_building.p4d: project file that can be opened in Pix4D Desktop. This section describes how to process the dataset in order to generate a 3D textured mesh of the building using Parrot Bebop 2. 1. Open the project example_bebop2_industrial_building.p4d. 3. On the Processing bar, click Start to start processing. This section describes how to create and process a project in order to generate a 3D mesh of a house. 4. In Name: Type a name for the project. 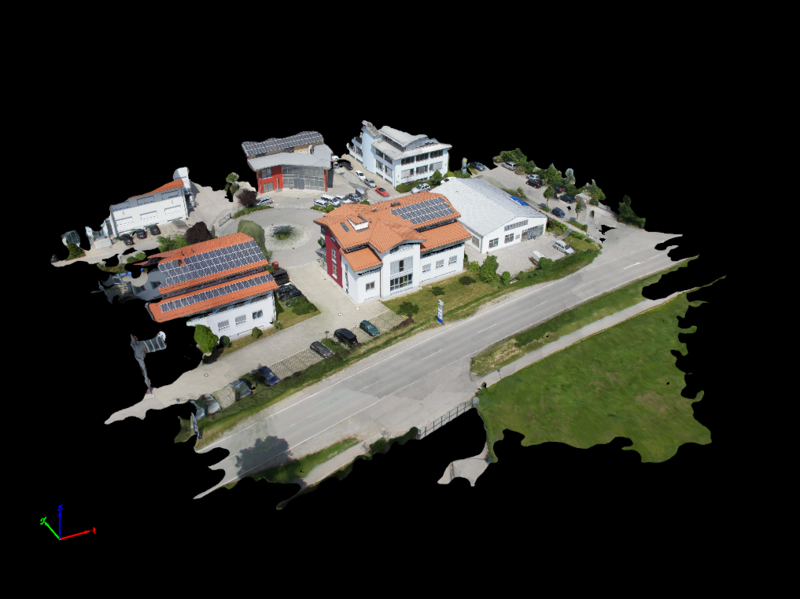 In this example type example_bebop2_industrial_building. Note: When the project is created, a folder with the same name as the project name typed in the Name field will be created in the selected folder and will store all the results. The .p4d project file will also be stored in this folder. 9. Click Add Directories... and select the images folder to add the images to the project. The folder contains the images of the grid mission and circular flight. Click Choose. The New Project wizard displays the Image Properties window. The image geolocation is automatically loaded from the image EXIF data and is given in WGS84 (latitude, longitude, altitude) coordinates with vertical coordinate system given by MSL = egm96. The camera model is loaded from the camera model database (Bebop2_1.8_4096x3320 (RGB)). 12. Select Known Coordinate System and Advanced Coordinate Options. Click From List... button, select World Geodetic System 1984 datum and WGS 84 / UTM zone 30N coordinate system, click OK.
13. Under Vertical Coordinate System select MSL. Set the value to egm96. 15. Click 3D Models to select the template. Click Finish to finish the wizard. The Processing bar opens at the bottom of the main window. 16. On the Processing bar select 1. Initial Processing and deselect 2. Point Cloud and Mesh. 17. On the Processing bar, click Start to start processing. Note: Pix4Dmapper automatically detects the sky in the images of Bebop2 and improves the Densified Point Cloud. For more information about the Processing Options: Menu Process > Processing Options... > 1. Initial Processing > Calibration. 18. Use the rayCloud to define a Processing Area to remove noisy points from the background and to keep only points of the building. For more information about how to draw a Processing Area with the rayCloud: How to select / draw the Processing Area. 19. Edit the Processing Area to focus on the area of interest. For more information about how to edit a Processing Area with the rayCloud: How to edit a Processing Area in the rayCloud. Note: In the above Processing Area, the Maximum and Minimum Altitude are set to 50.00 [m] and -10.00 [m] respectively. 20. On the Processing bar, deselect 1. Initial Processing, and select 2. Point Cloud and Mesh. 21. On the Processing bar, click Start to start processing. The goal of this project is to get an orthomosaic and a 3D point cloud of construction site. bim_dataset.p4d: project file that can be opened in Pix4Dmapper. This section describes how to process the dataset in order to generate an orthomosaic. 1. Open the project bim_dataset.p4d by double clicking on the file. Note: As this project's goal is to generate an orthomosaic for a construction site, the 3D Maps template has been selected. This section describes how to create and process a project in order to generate an orthomosaic for the whole project. 4. In Name: Type a name for the project. In this example type bim_dataset. 5. (Optional) In Create In: Click on Browse, and on the Select Project Location pop-up window, navigate to select the folder where the project and results will be stored and click Select Folder. 6. (Optional) Activate the check box Use As Default Project Location to save all new projects in the selected folder. The New Project wizard displays the Image Properties window. The image geolocation it is already set in the Image Properties window under section Image Coordinate System and does not need to be changed. The image geolocation is loaded. The camera model is loaded from the camera model database (S.O.D.A_10.2_5472x3648 (RGB)). 12. 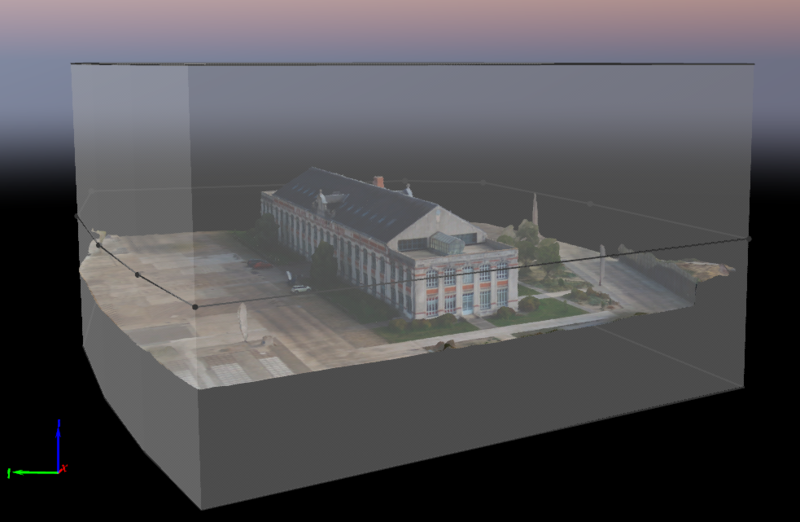 On the left of the window, select the 3D Maps template. 14. Under Unit, select m.
16. Select Advanced Coordinate Options and under Vertical Coordinate System select Geoid Height Above WGS 84 Ellipsoid. Set the value to 0. 17. Click Finish to finish the wizard and create the project. The Processing window opens at the bottom of the main window. 1. On the menu bar, click Process > Processing Options... to open the Processing Options window. 2. On the Processing window, click Start to start the processing. Once processing is finished, the Orthomosaic can be visualized and modified in the Mosaic Editor. Hi, there is no GCP files in the Quarry sample dataset. Does anyone know where to download? Thank you!! I too am having the same issue. Does anyone have a resolution to this problem? I'd love to see a sample that has multiple flights using different methods, is this acceptable practice? E.g. Grid flight, circular flight and GCP's.